I love bringing recipes to life in my home from restaurants I’ve loved. 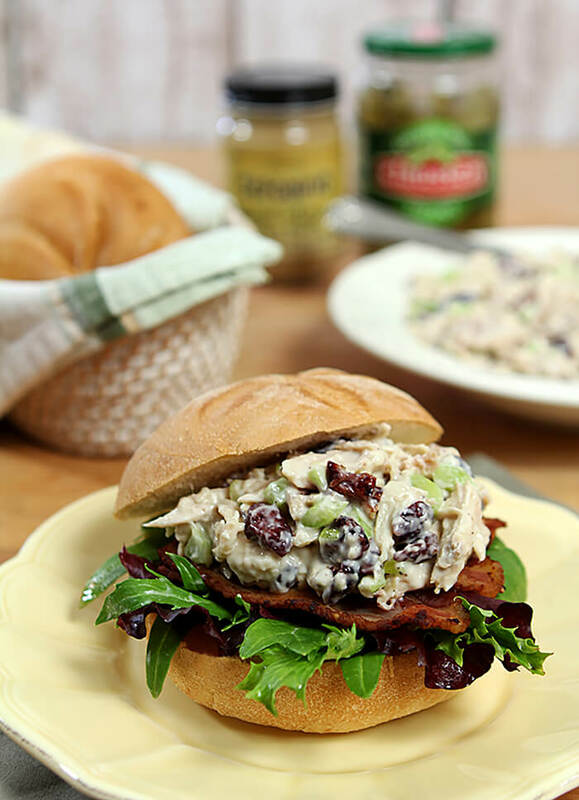 This Marshall Field’s Chicken Salad Sandwich is an old recipe but it’s still just as delicious today as it was when I first had one on a trip to Chicago many years ago! Marshall Field’s Department Store used to be known far and wide as THE grand dame of Chicago. Much like Famous & Barr and Stix, Baer & Fuller in my hometown of St. Louis, they weren’t just a store, they were an institution. Although never having visited Marshall Field’s as a kid, I’ve heard from people over the years that it bears a legion of similarities to the experiences I knew with Famous and Stix so I feel like I can imagine a visit with some clarity. THE place to go downtown during the holidays with windows magically decorated for the season and always on the parade route where I imagine we would stand barely able to feel out toes from the cold but not caring as we anxiously anticipated our first view of SANTA! More memories include elevators with heavy accordion closures instead of doors and an operator who managed the board, asking us, ‘What floor please?’ For a young girl with a lot of responsibility in our big family that one small thing always made me feel so special, like we had been magically transported to another place entirely where someone took care of our every need! Ah…those were the days. Still, even then, those many years ago, I looked so forward to visiting one of the flagship restaurants. I have sweet memories of a favorite hot fudge sundae from Stix, Baer & Fuller when my mother worked there when I was a teen and as a young adult, lunch at Famous & Barr always meant what is still my favorite French Onion Soup. When I was eighteen I finally ventured inside Marshall Field’s for the first time. A friend and I had decided to travel north to Chicago for the weekend and having lunch at this iconic department store was on our agenda. It did not disappoint; beautiful, stately and with an old world feeling of grace and appreciation for customers that is so lacking today. However, shopping was not on my mind as much as lunch so headed for the dining room upon arrival. My choice for lunch was this fabulous chicken salad. With a mix that included toasted pecans and grapes, it was so different from any chicken salad I had ever had and it was ‘love at first bite.’ Today I might ask the chef for the recipe but then I just left with a great memory…and one that I’ve never forgotten. Fast forward many years to 1994 and my foray into the world of this new-fangled thing called the ‘Internet’ and my first food website. I know I starting searching for many dishes I thought worthy of including but many were not available online. Was I excited to find that this was? Absolutely…and it has been my mainstay recipe for all the years since with really minimal changes on my part. Originally calling for homemade mayonnaise, I typically bypass that step. Yes, it is wonderful and go for it if you must but I’ve just found that the ease of prepared mayo trumps the slight difference in taste so I just use what is in my fridge (I currently am loving an olive oil blend). I also might throw in some dried cranberries in lieu of grapes. Don’t get me wrong…I lprefer the grapes but when the spirit moves me to make chicken salad I don’t always have them on hand and I’m not the kind to run to the grocery store for one item so cranberries on hand? I use them. Sadly, all of these great stores have been wrapped up in the Macy’s banner over the years and they are not the same. It’s funny but I used to associate Macy’s with something magical when sitting on the floor with my kids and watching the Macy’s Thanksgiving Day Parade; but as for the stores, nothing all that special and certainly no gorgeous dining halls and renown foods on the menu. Revisiting them is only done through a food experience and this one is so close to my first trip to Marshall Field’s that I can almost hear that operator asking me, ‘What floor please?’ This Marshall Field’s Chicken Salad Sandwich is truly so iconic that it is still perfect today. Try it, you’ll see! Mix mayonnaise, sour cream, Dijon, sugar, salt, white pepper and lemon juice well. 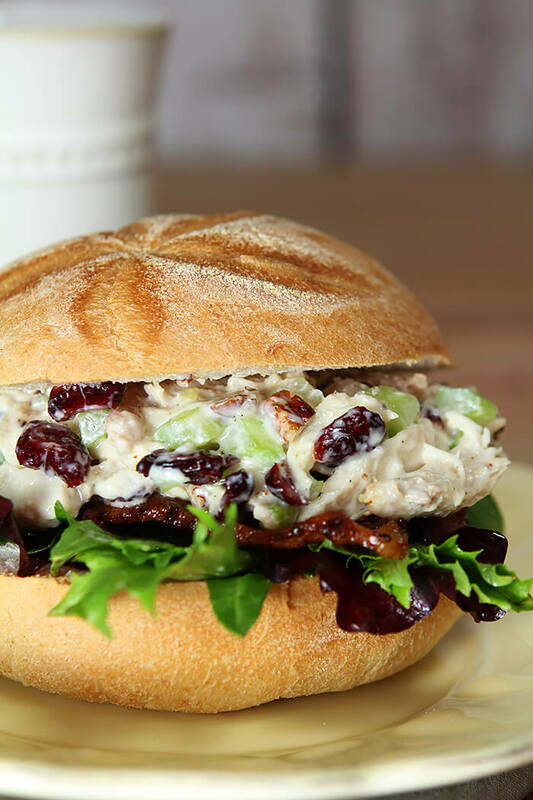 Mix together, chicken, celery, onions pecans, cranberries and dressing. Mix well and refrigerate at least 2 hours. For sandwich, layer bacon, lettuce and chicken salad on soft roll. Serve with dill pickle and chips. I so enjoyed reading your article and fondly remembering Dillard’s (originally Stix Baer & Fuller’s) shrimp salad sandwich on toasted cheese bread, Famous Barr’s John White burger and French Onion soup, Scruggs Vandervoort & Barney’s club sandwich with that wonderful unique tasting mayonnaise I realized years later was homemade, Gold Brick Sundaes, etc. Coincidentally, I ran across your blog while searching for another old favorite, the Maurice salad dressing from Dillards. My big dream, however, is for the spaghetti sauce recipe from Sala’s restaurant on The Hill, now closed for many years. There has never been anything like it, and I have had no luck in any of my internet search attempts. Being from St Louis with a food background, perhaps you have some idea or lead on how to find this. I just cannot seem to come to grips with the idea that I will never tase this fabulous sauce again. In any case, thanks for the trip down memory lane. I wish I could help Julie but no such luck. I’m embarrassed to say that going to The Hill was never in my repertoire of destinations when I lived there and yet in ensuing years I realize it might have become my favorite place if I had; I love all things Italian! Now you’ve got me wondering too. How can these treasures disappear with zero memory of them? 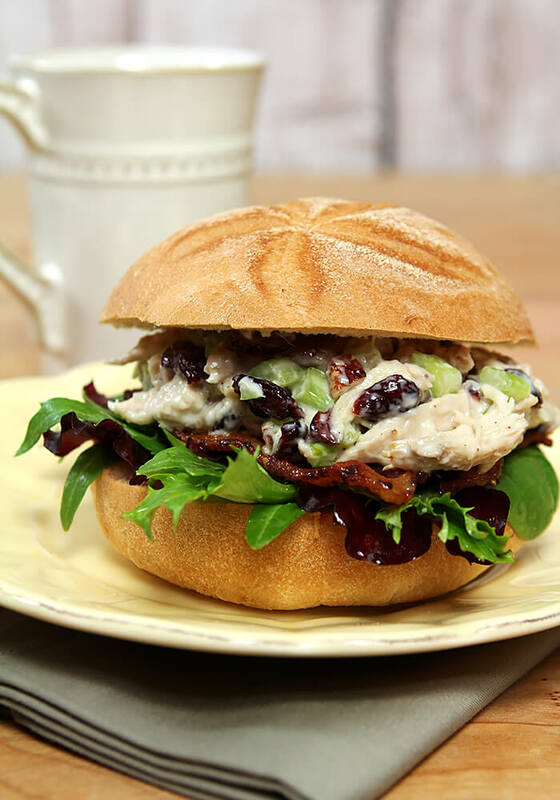 This recipe sounds EXACTLY like the yummy chicken salad they sell at one of our local St. Louis grocery chains. Hmm, maybe they “borrowed” it from Marshall Fields. But serving it with lettuce and bacon? Awesome! Thanks for sharing the recipe. What a great way to use up leftover rotisserie chicken. In Mpls. the store was Dayton’s. Chicken salad recipe sounds good. I’m looking for info about a Fields’ Marketplace food product discontinued in 2006; I’d like 2 reintroduce this Marshall’s item (later. May Co. Dept. Stores in Mpls.) which was sweet and excellent w. real berries: RASPBERRY VINAIGRETTE AND MARINADE, 12 FL. OZ. barcode 9875020058. P.S. I wish writers would quit using the following stupid terms; both “zen*” and also “fast forward” annoy the hell out of me. * people who use the term usually have zero understanding about this. *they always know nothing about it. Both are insipid. Don’t understand what you are talking about???? So I used the term ‘Fast Forward’ Steve and you don’t like it? I have no problem with that; we all have our own peccadilloes. Know what I don’t like? Someone coming to visit MY space and leaving their rude commentary; now that’s what I call insipid! (Per Merriam Webster: Not interesting or exciting : dull or boring. : lacking strong flavor). I’m confused too. Were you thinking I might somehow be able to assist you in your search for the aforementioned product? You have to be kidding right? Good manners are not dead in my book and your bad manners warrant no assistance from me! Thanks for posting this! I’m a Chicago girl, raised on Marshall Fields since a little girl. Field’s is such a part of my memories. It was pretty upsetting having Macy’s take over, and the way they did it. I’m one of many Chicagoans that boycotts Macy’s. I stepped inside the State Street store once because the people I was with wanted to go in. Man, was it different. Kind of sterile feeling. And hardly any customers. The class of Marshall Field’s was definitely gone. The sandwich looks delicious, the sauce sounds intriguing and tasty and I especially enjoyed reading everyone’s comments as they took a walk down memory lane with you in this post. 15 years ago my friend, Mary, insisted on taking me for a tea at Marshall Fields. It was Christmas time and we did some shopping. I was pregnant with Nathan and had been laid off from my job and she thought sharing a Chicago tradition would cheer me up. Mary and I are still good friends and it’s a great memory. So glad you shared your memory of Marshall Fields, too. I really miss the old department stores. Macy’s is very good at being totally vanilla…they were big and gorgeous and a trip to them was special; so glad you enjoyed a trip down memory lane with me! Sepo sauce is new to me — I’ll have to try that. Never had the chicken salad at Marshall Field’s although this look wonderful. Love the nuts and fruit — really nice touch. Thanks for this. New to me too and not sure how widely distributed…but just using Dijon is perfect as well…and it is a great chicken salad. this reminds me of our famous store with the more or less chicken salad recipe. up with a recipe of it so we can move forward with this yummy salad. I used it in lieu of Dijon mustard so just use the mustard; it will still be fantastic! Sounds good. Will make it if I can find Sepo sauce. Where might I find it here in Wilmington NC. I’ll look in all the grocery stores. My bad that I didn’t ask them about local shops but I think it’s only available online; there is a link in my post. If I find out different I’ll let you know! If you can’t find it just omit, it’s still a great chicken salad! 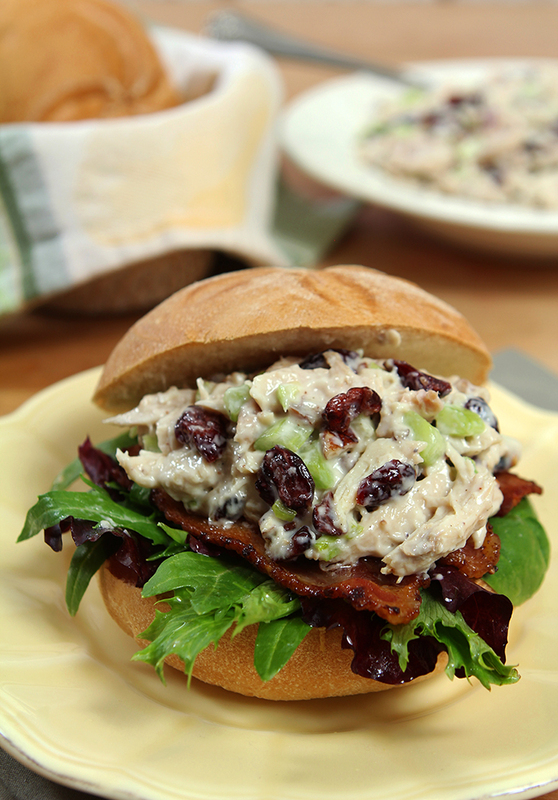 This is very close to my favorite chicken salad recipe. I always a little bit of something sweet in the mixture, normally grapes for me, but cranberries sound delicious, too! I haven’t heard of Sepo Sauce – sounds interesting and maybe a little like Durkee sauce. I use to go to Famous Barr and Stix. Remember the wedge wood too and Pevely Dairy across from Famous. My first job was at Stix when I turned 16….a long time ago. I grew up in St. Louis. Want to talk small world Mari? My mother was the person who brought the idea of designer boutiques to Stix! She was instrumental in working with the store and companies to feature them each individually more and not just all smushed together on one rack. My that was too long ago! I do remember the name Pevely’s although I grew up in the burbs and better remember Bergen’s Dairy where I got the best butter brickle ice cream ever! If I recall correctly we could get Pevely’s Milk though…didn’t they have stores all over? Always love hearing from someone that these stories resonate with…thanks for sharing. Thanks for this recipe. My favorite Marshall Field’s dish was their hot turkey sandwich. It was different than any other turkey sandwich I’ve ever had. Wish that recipe was available too. You have given a great gift to my family. Grew up in Chicago and Marshal Fields Christmas Windows were overwhelmingly beautiful and shopping an experience one never forgets. However it was lunch, the chicken salad ordered each and every visit to the beautiful, gorgeous dining room. When finally had to move because of a job, I would return to visit my mother and of course it was always a trip to Marshal Fields. But most important was when my mother and 1 year old daughter were able to join us that has left a burning memory that will never be forgotten. My daughter now has 2 daughters and her family are having dinner with us and GUESS WHAT I WILL BE SERVING TOMORROW NIGHT. Once again heartfelt thanks for conjuring up all the wonderful memories and providing me with my favorite recipe. I love hearing that Lilli; hope you enjoy it as much as we do; it is seriously my favorite chicken salad recipe.